How many times have you strolled over to your neighbor’s home to borrow a cup of sugar? 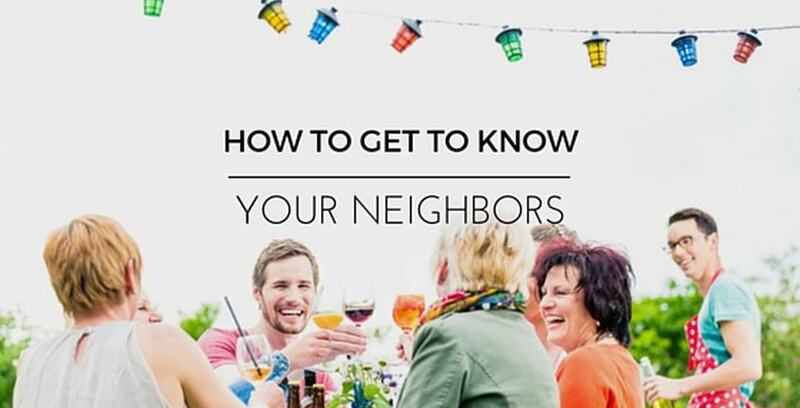 Whether you’re the type that considers the house next door an extension of your own, or you’re acutely aware of its existence but just moved to town, it’s important to get to know the people that reside down the street. You don’t have to have a long list of shared interests with your neighbors, but getting to know them will provide you with a little extra security and peace of mind. Plus, if you ever need anything, you have people you can count on if you need somebody to grab your mail when you’re on vacation. Maybe you’ll become friends. Maybe you’ll simply say hello whenever you walk by their door. Either way, here’s how you can get to know your neighbors. Even if you’re open to the idea, you aren’t going to shake any hands from the comfort of your own home. If you enjoy sitting on your private balcony, perhaps try sitting in a more open area in the backyard where your neighbors could approach you. Go for a walk, say hello to passersby, take your dog for a walk and plan adventures around your neighborhood. The first step in getting to know your neighbors is getting out there and giving yourself a chance. If blindly meeting your neighbors isn’t your forte, try joining a group or club in your neighborhood. What seems like a happenstance meeting could yield a great friendship with a likeminded person you can call upon. These chances and activities also give you something to occupy your time during interactions. The common ground you establish will strengthen an eventual friendship. Here’s where you need to channel your confidence. Instead of hoping for a chance meeting with one of your neighbors outside of your home, why not invite them over yourself? Hosting a small get-together, or even a larger block party, can be an excellent opportunity to get to know people in your own element. You don’t need to plan anything extravagant. Ask your more established neighbors to pitch in and help you get organize. They’ll likely appreciate the gesture, and perhaps gatherings will become a tradition! If you’re in need of a place to store your things during a moving transition, Storage Direct can help. We know you have a lot on your plate and you want to get to know your neighbors, and we’re here to help you stay organized. Contact us to learn more about our storage options and to find a location near you!